View in room. Click on image to enlage it. The painting is magically glowing in a dark, because a special paint accumulates light and releases it at night. It shines joy to your life. Textured acrylic medium, mirror paint, metallic and interference paints add shining effects when exposed to natural or artificial light. Painting changes its appearance when observed from different angles. All sides are painted as continuation of the painting. See image. No frame is required. It is ready to hang on your wall right away. Painting has a heavy-duty protective topcoat that allows wet cleaning with a soft moist cloth. It is resistant to water, abrasion, impact, stains, chemicals and UV rays. Condition: New - directly from artist. 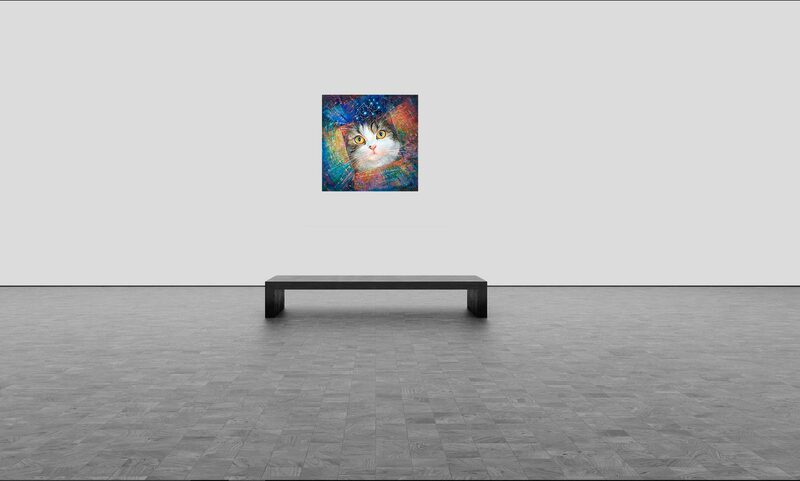 Description: The Cat Maru is an inspiration for the artwork. He is from Japan. “Maru” in Japanese means “circle” or “round”. The cat is world famous for his passion to explore boxes. Seven similar objects and symbolic image of a hidden owl figure are in the painting. The number 7 represents good luck and prosperity, and the owl wisdom of love and oneness with Creator of All That Is. Can you find seven similar objects and the owl on the painting? 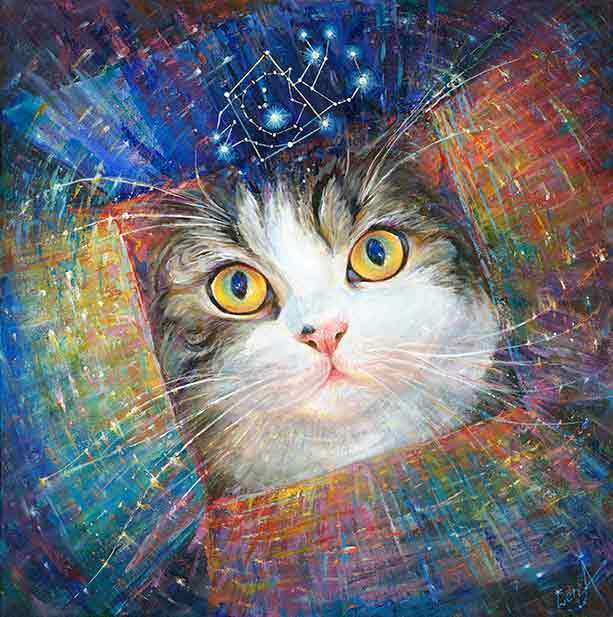 In the middle of the painting you see detailed portrait of the cat looking inside the cosmic box. 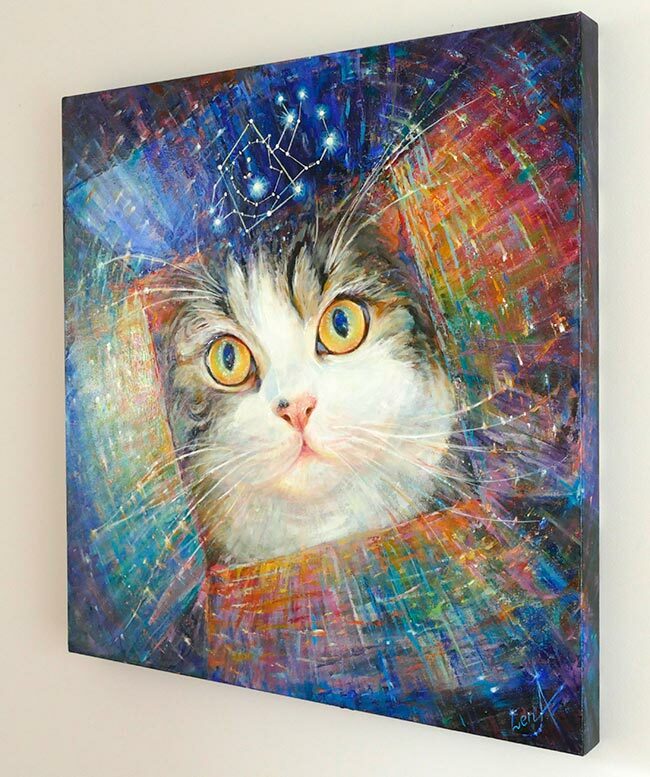 He contemplates the “Maru” constellation floating in infinity of the Universe. The “Maru” constellation is created by Elena based on the Pleiades (Seven Sisters) constellation and surrounding existing stars. All stars are real and they are at their original locations. Elena just connected them in a new constellation and called it “Maru”. Look at it... Do you see the line drawing of the cat Maru jumping into the box? The hidden image of an owl in the artwork suggests a thought that a secret wisdom could be hidden deep inside the box. Did you find it? Take a look within yourself and find your own hidden energy, healing, joy, wisdom and abilities to create miracles in your life..
Unlock your amazing power within. For for your healing and joy. Join many of those who already like spiritual art from LightFromArt.com! Read and watch more video testimonials about Elena's Art here. Take advantage of today's awesome Promotion. See Details here. Bring Healing, Joy and Good Luck in your life with the magic art. Scroll up and buy it now!